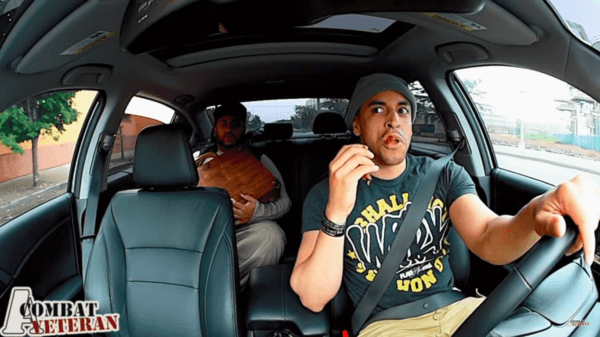 Check out this hilarious mock skit of a combat veteran driving an ISIS passenger during an Uber ride. This video most likely accurately details what would happen if a combat veteran ever met a member of ISIS in person. However, getting to the part where he gets out of the car and beats him to a pulp would probably happen much faster. As the veteran pulls up to his destination to pick up his passenger, he notices a man wearing a white long robe and a headscarf. The man, struggling to speak English, asks the veteran if he his the Uber driver, to which the veteran says yes. As the passenger gets into the vehicle, he tightly holds onto his suitcase. The veteran, who has pulled out a small strip of bacon and begins eating it, asks the passenger why he is heading to the airport. Immediately, the passenger tells him to stop asking questions about where he is going and who he is going to visit and to just drive the vehicle. After enough persistence from the combat veteran, the passenger says that he is going to visit his friend Hussein. After the veteran asks what his name is, the passenger tells him. The veteran then pulls up his phone and checks to see if the passenger’s name is on the FBI database. The passenger immediately gets scared and tells the combat veteran to not get the FBI involved. The veteran then tells the honest truth to the passenger and that he is not bringing him to the airport. He then clocks out and tells the passenger that the ride is for free. The veteran then grabs the suitcase in the car and throws both it and the passenger into the trunk of the car. The combat veteran drives away and a news station flashes across the screen on a television saying that ISIS has planned attacks on American soil.